Heavy duty hose for wet exhaust service. Multiple ply construction with reinforcement for good flexibility and resistance to collapse. Meets all USCG Standards for Recreational Boating. 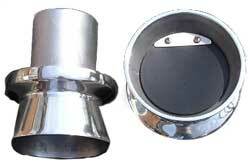 Thru-transom exhaust ports are epoxy powder coated black for maximum durability. Hose connection ends are ring-grooved to ensure a secure water-tight seal. They also include Salisbury exhaust guard flaps, to prevent water from entering engine due to bachwash. Fits 2-7/8" I.D. Hose. Sold individually. The most widely used method of preventing engine backwash. Replacement Flaps for Trumpet exhaust ports. Includes Rubber flap, Screws & Stainless plate. 396-427 & 454 cu. in. Big Block chevy. 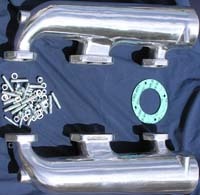 Cast aluminum high performance exhaust manifolds. 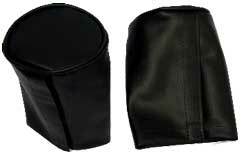 For use with Glenwood high performance exhaust manifolds. 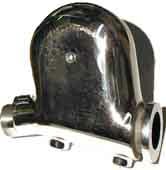 These high performance risers are water jacketed, and feature a full 3"exhaust outlet.